Available as low as $18.99 per bar over spot! Precious metal bars are popular products for investors and collectors looking to protect their wealth. Gold and silver bars have been popular for decades, but purchases of platinum products are on the rise. 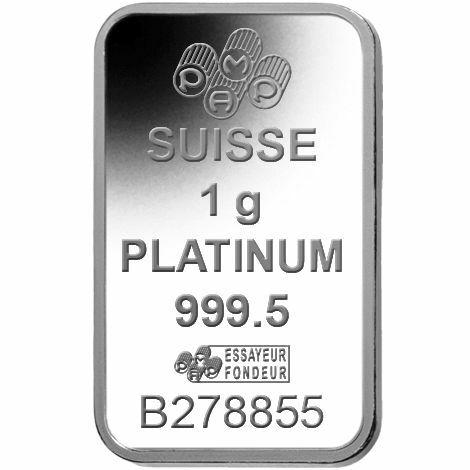 Now, one of the most popular bar designs in the world is available in platinum with the 1 Gram Platinum PAMP Suisse Fortuna Bar, yours to purchase today from Silver.com. 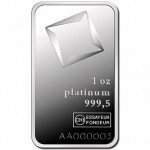 Consists of 1 gram, or .03215 ounces, of .9995 fine platinum. Bears the famous Fortuna design set. Struck with individual serial number and assayer’s mark. Multiples of 25 ship in sealed mint boxes. 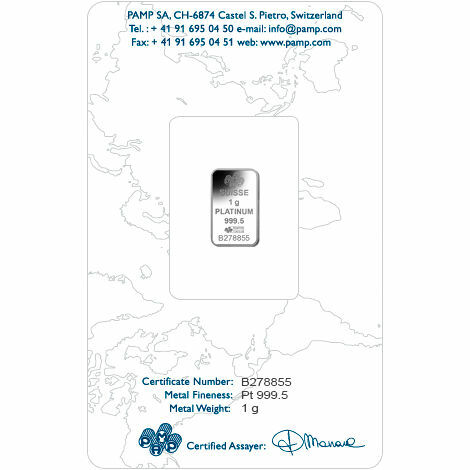 PAMP Suisse is one of the world’s foremost producers of gold, silver, and platinum bars. Its Fortuna design features the Roman goddess of fortune. She played a number of roles in Roman culture and religion. In addition to her status as a goddess and daughter of Jupiter, the King of the Gods, Fortuna was also associated with luck in Roman religion. 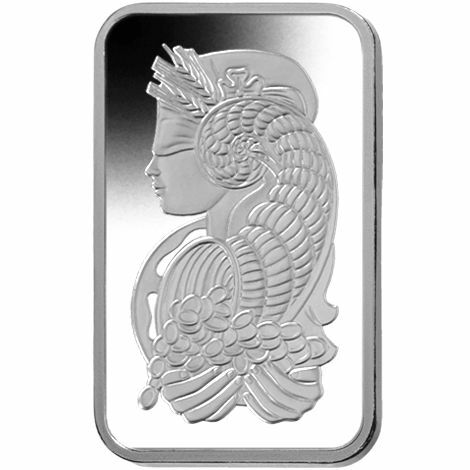 On the obverse side of each bar is the Fortuna design. She is often featured wearing a blindfold or veil, similar to modern versions of Justice. In the PAMP Suisse design, Fortuna wears a blindfold as a cornucopia on her head spills a bounty of riches. At the bottom of the design, her clutched hands capture the bounty of coins. The reverse side of each 1 Gram Platinum PAMP Suisse Fortuna bar has all the identifying engravings that investors and collectors look for. Arranged vertically from top to bottom, the bar is inscribed with the PAMP Suisse corporate logo, the weight, metal content, and purity of the bar, an individual serial number, and the assayer’s mark. PAMP Suisse is the leading precious metal producer in the world. Though it has not been around as long as some brands, its logo alone is enough to convey quality and purity to investors and collectors. Founded in 1979, PAMP Suisse is now part of the global MKS Group. Based in Geneva, MKS is a major precious metal and financial services firm with offices located around the globe. If you have questions about these 1 Gram Platinum PAMP Suisse Fortuna bars, don’t hesitate to reach out to a Silver.com associate. Our team members are available on the phone at 888-989-7223, as well as online through our live web chat and email services. 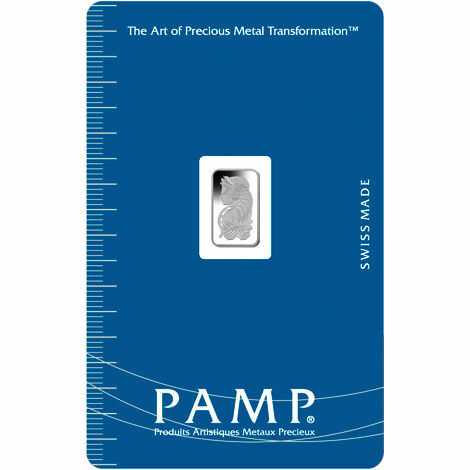 If you are looking for similar products, be sure to check out our selection of PAMP Suisse Gold Bars.